previous post: Finland’s problem is exactly the euro! It is easy to get distracted by other important events in the last week by the enormity of the information that has been released in the so-called – The Panama Papers – which document around 40 years of secretive banking deals, tax dodging, criminal money laundering and political corruption. The information shows that “major banks are big drivers behind the creation of hard-to-trace companies” in tax havens and once again demonstrates the urgency of root-and-branch banking reform to wipe out their ‘non-banking’ businesses. The revelations from that leak (‘hack’) will continue for some time given the size of the data. But the world keeps turning and the IMF keeps informing us, either through their own voluntary statements or through information that they clearly don’t want us to know about, which gets leaked, just what a rotten institution it has become. Read on and feel sad. On February 11, 2011, the IMF’s independent evaluation unit – Independent Evaluation Office (IEO) – released a report – IMF Performance in the Run-Up to the Financial and Economic Crisis: IMF Surveillance in 2004-07 – which presented a scathing attack on the Washington-based institution. That makes the IMF more than an incompetent and biased organisation. In my view it makes them culpable. Who is going to pay? As the private debt was building up and the shonky (and criminal) bankers were increasingly defying responsible and ethical business practice, the IMF was part of the cheer squad – urging, no, bullying governments to deregulate further and undermine the working conditions further and to reduce the scope and quality of public services. Foreign investment returned to boost the cotton industry but most of the returns courtesy of the IMF privatisation policies go to foreigners (who presumably then seek out firms in Panama to hide their cash for them) and living standards remain low for the locals. All down to the IMF and the corrupt cronies that have been supported. So the message is clear – the IMF were proponents of the “Great Moderation” which was the dominant narrative during the 1990s and later. Mainstream macroeconomists – like John Taylor, Robert Barro, Robert Lucas, Ben Bernanke and all the rest of them all preached that the business cycle was contained if not dead and the only interesting questions were how far governments could go in deregulating their labour and product markets and creating free markets. It was a arrogance that you would not believe unless you worked, as I do, in the profession. It was a gloating, pack-mentality. Like dogs, the mainstream profession hunted in packs and at conferences aggressively suppressed alternative views. I could share many examples where a speaker who did not share the Washington-Harvard-Chicago consensus was set upon during question time with the sole aim of humiliating them. Sometimes the gang didn’t even wait until the paper was finished before launching their screeching attacks. I have personal experience of being on the reciving end of this treatment several times in my career. Their churlish mindless manner was a directly correlated with how mindless their theoretical and applied understanding of the monetary system was. … needs to (i) create an environment that encourages candor and considers dissenting views; (ii) modify incentives to “speak truth to power;” (iii) better integrate macroeconomic and financial sector issues; (iv) overcome the silo mentality and insular culture; and (v) deliver a clear, consistent message on the global outlook and risks. The IMF has had a flawed policy of recruitment into the more senior positions. It hires economists from mainstream backgrounds with doctorates – so you can be sure they have a very narrow (and flawed) conception of the way the macroeconomy works. Most of them will be very capable in a technical sense, which is important. – Change the insular culture of the IMF through broadening the professional diversity of the staff, in particular by hiring more financial sector experts, analysts with financial markets experience, and economists with policy-making backgrounds. First, who would the IMF consider to be eminent outside analysts? They will end up going to Harvard or wherever and hiring more mainstream hacks as well-paid advisors. No solution to be found there. The point is that the mainstream macroeconomists in the academy, the central banks and the treasuries all failed to understand the unsustainable dynamics that their neo-liberal policy frameworks were generating. They were all part of the club whose memberships extended beyond the front door of 700 19th Street, N.W., Washington, D.C. 20431. Second, the majority of the financial sector experts and economists with policy-making backgrounds are all tarred with the same brush. This is not solution at all. These recommendations will just introduce another layer of well-paid orthodox consultants and will do very little to diversify the views of the organisation or dis-abuse the top management of their willful ignorance when it comes to the way the macroeconomic system works. The solution is to disband the organisation and governments should immediated defund it to precipitate that dissolution. A new institution is needed to help poor nations overcome balance of payments problems and to divert funds from rich nations to poor nations but it would look nothing like the structure of the IMF. Over the last few years the IMF has become a schizoid organisation. It continues to pump out nonsensical economic analysis and propose Draconian policy plans for struggling nations but at the same time, perhaps recognising its incredibly poor forecasting record and its failure to deliver a message of any kind that reflects the facts, some contrary papers have emerged. As an example, please read my blog from Monday – Fiscal policy is a potent instrument for productivity growth. But if you think the underlying culture of the organisation has changed very much then you would probably be wrong. Two IMF officials who are “managing the Greek debt crisis” are recorded in the conversation. Like all scoundrels at present, the upcoming referendum on EU Membership in Britain was used in a negative way. I am astounded at extent to which one disaster after another will follow if Britain does what it should do and exits the European Union. I have even read stories that the Premier Soccer league will fall into disrepute and Spain’s first division competition will take over all the players. Anyway, the IMF officials were not loath to buy into the ‘Brexit disaster’ scenario. The context was a meeting in Athens to discuss the next tranche of bailout assistance – although calling it a bailout is stretching any credible meaning of that word. The Greek people are being punished by the Troika not saved! The failure to agree a deal in Athens this week not only delays the move to debt relief, but also raises anew whether the IMF will participate in Greece’s third bailout. The fund has pushed hard for more thorough reforms because it believes Greece’s economy will not fully recover without a significant overhaul, and Greek officials believe the IMF is looking to exit the programme entirely. The teleconference occurred the day after this Financial Times report was published. It was discussing when the bailout talks that were stalled might resume. One IMF official said that any date would be premature given that “when we might not have an agreement inside the Troika on how to proceed”. The other responded that the Europeans would have “to accept our targets for the debt relief” and they proceeded to talk about discussing some percentages that might be entertained. The event that brought Greece to heal was detailed above – the June 2015 ECB decision to starve the Greek banks of liquidity – in total violation of its charter to maintain financial stability within its jurisdiction. The Greek finance minister wanted the bailout negotiations to be tied in with the massive humanitarian crisis in the northern Greek town of Idomeni where many thousands of refugees are stuck with nowhere to go. These IMF officials were clearly plotting to inflict another “event” on the nation that is on the front line of the refugee crisis. But it is not Greece that matters to them but their relative power viz-a-viz the European Commission, the ECB and the German government. They want all parties to be brought to heal and they articulate a preparedness to drive a particular nation (Greece) to the brink of insolvency and all that means for the already struggling population, just to get their way. Sounds close to how a sociopath would act. Tie that in with the disdain that The Panama Files reveal on behalf of political leaders throughout the world for their citizens and we are moving closer to major social instability. My view is that cleansing the minds of all of us of this neo-liberal nightmare and getting rid of the sociopaths from any positions of power is not going to come peacefully. And further – central banks can never go broke! We can dispense with the idea that central banks can ever go broke once and for all courtesy of a footnote on page 14 of a recently released ECB Occasional Paper (169) – Profit distribution and loss coverage rules for central banks – published yesterday (April 5, 2016). Central banks are protected from insolvency due to their ability to create money and can therefore operate with negative equity. Central banks cannot run out of money because they are the ones that create the money. And you cannot run out of something you can create yourself. While it is unlikely that this paper will forever extinguish confusion over central bank capital, it does at least include a handy cut-out-and-keep footnote to be used whenever someone warns about the risks of a central bank making a loss. 1. The ECB cannot go broke – get over it. 2. The US Federal Reserve is on the brink of insolvency (not!). 3. Better off studying the mating habits of frogs. Any journalist that ever writes that central banks will run out of money or face problems of negative equity should be sacked and sued for lying. The next statement we will see someone write sooner or later is – Currency-issuing national governments can never run out of money. You can’t promise, you can’t promise money that’s not there … the Gillard government … was spending money she just didn’t have. Not only should that politician resign in disgrace but the journalist should resign for not knowing to ask him the obvious question – yet still pretending to have the expertise in these matters to ask any questions. I will write more about Spain in the coming week but the latest news is that the national government is thoroughly in breach of Eurozone fiscal rules and is growing strongly as a result. Still, 2015 was also a year in which economic growth surpassed all forecasts and tax revenues jumped significantly. The article doesn’t draw out the obvious causality – higher fiscal deficits courtesy of higher social spending in the regions, higher expenditure on health services, and some large scale public infrastructure projects have driven the higher growth. Why call the rise in the deficit above the fiscal rules as “exceeding gloomiest forecasts” just goes to show the bias in the reporting. Q: When is a good thing gloomy? A: When you are a neo-liberal sociopath in the Brussels political elite who looks out only for the top-end-of-town. 1. Madrid, May 5, 2016 – 19:00 at the Club de Amigos de la Unesco, Calle Atocha 20, 28012. 2. Badajoz, May 6, 2016 at 12:00 at the Aula Magna de la Facultad de Economía. 3. 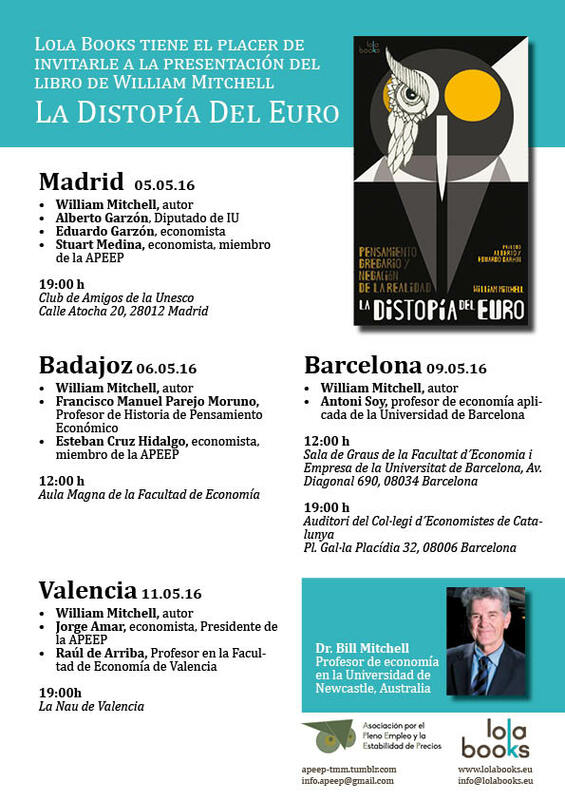 Barcelona, May 9, 2016 at 12:00 at Sala de Graus de la Facultat d ́Economia i Empresa de la Universitat de Barcelona, Av. Diagonal 690, 08034 Barcelona. 5. Valencia, May 11, 2016 at 19:00 at La Nau de Valencia. Note: We are soon to finalise a sister edition, which will cover both the introductory and intermediate years of university-level macroeconomics (first and second years of study). Link to ECB Occasional Paper actually links to this article Bill. Thanks for the correction. I have fixed it now. Appreciated. Thanks very much. I have updated the link. No problem Bill. I appreciate the effort you put each update almost every day and I’m impressed by your tenacity in publishing these comprehensive essays day in, day out. Thank you for being one of the few voices of reason in this country on matters economic. I’ve learned a great deal reading your essays as well as reader’s comments, and I have directed many to your site over the past two years. Lagarde points out – ‘we’ve got low-inflation, low growth and high debt’ – she get’s paid well for these stunning insights, clearly her wisdom is indispensable to the well-being of the world! Anyone out their got the feeling that we’re all having the piss taken out us ? Thank you, yes, for you tenacity and I agree about the journalists. Yes, the halls of power are dark indeed. The IMF is an arm of US foreign policy, as such, it’s overarching mission is to carry out US/Wall Street’s agenda. See the IMF’s arbitrary rule changes (Ukraine) to isolate Russia and China as one glaring example. This is no secret and also why the IMF leaves a trail of human and social devastation where ever it is involved. Their actions towards Greece and the Germans parallels Victoria Nuland’s (US Assistant Secretary of State) attitude towards the EU. I suspect that the US hegemonic ambitions and it’s institutions such as the IMF, World Bank etc. will not be forced to change until powers such as China and Russia are forced to the brink of war.